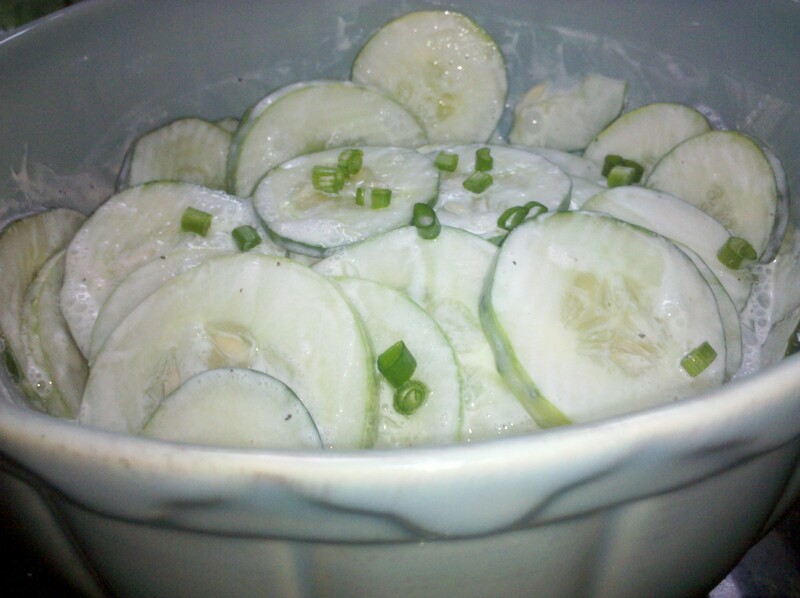 Cucumber salad is a big summer favorite around here. Fortunately, we have cucumbers coming out of our ears. Unfortunately, the cucumber crop always seems to explode the week we’re away on vacation, so we have more than a few baseball bat sized cucumbers that are not so wonderful to eat. This is a recipe that I’ve tweaked frequently over the years, but I am of the school that says it’s hard to screw up cucumber salad, so improvise away! Today I garnished with some scallions from my garden, but sometimes I will throw in a thinly sliced red onion if I’m feeling sassy. Whisk together first six ingredients until well combined and smooth. Add cucumbers and chill. This entry was posted in Side Dish and tagged cucumber, salad, sour cream by Mom Mom's Apron. Bookmark the permalink.